The fourth annual Hemiplegia Awareness Week – and our new animated film – was launched with a Thunderclap social media campaign. With 385 supporters (more than triple our goal), more than 500,000 people may have seen our message! People told us where low awareness impacts them most. We listened. So HemiHelp’s 2015 campaign helped people raise awareness amongst those they interact with regularly – especially in schools and workplaces. People told us when others ‘get’ hemiplegia’s relationship to the brain, it can clarify the often complex effects. So HemiHelp crafted an Awareness Week message and visual highlighting hemiplegia's connection with one side of the brain. 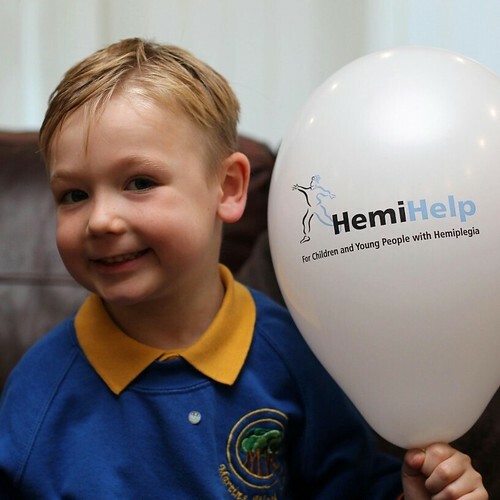 What is Hemiplegia? A short animated film – which soon had thousands of views! My HemiCheck: An innovative online tool – a survey and printable summary of how hemiplegia affects one – to help teachers, bosses, support providers, and others. Hemiplegia Daily Q&A: Infographic facts, shared on Facebook and Twitter. People also shared directly from our website – the most popular Awareness Week page! Awareness downloads: new and old posters and booklets, all in one place, to print out and distribute. These tools – along with our Media Guide, Sweet Talking Tea Party guide, and more – are available for year-round awareness! Use them anytime! Many people initiated 'real world' activities for HemiHelp's traditional 'bookends' starting and ending Awareness Week: Mitten Monday (a symbolic icon of hemiplegia awareness) and Sweet Talking Friday (tea and cake parties to raise awareness or funds). Athletes, comedians, TV presenters, and other high profile individuals joined supporters sharing Mitten Monday photos. Also on Monday (Awareness Week's first day), noted comedians donated their time for Fancy a Laugh? Not ‘Alf! celebrating – and fundraising for – HemiHelp. People shared their hemiplegia experiences, showed HemiHelp's new film, or distributed awareness materials in workplaces, schools, community centres, and other places. Many ordered our customised Awareness Packs (with new user-suggested awareness stickers – the most popular item!) for their activities. Others raised funds alongside awareness: including the Awareness Raffle, London Comedy Night, Sweet Talking Friday cake sales, collection boxes, and more. And in Birmingham, with HemiHelp’s input, a comprehensive Hemiplegia training day for teaching and support staff was held. Surrey Hills Radio made us their Charity of the Month – featuring interviews with athletes Joseph Craig, Rhys Jones, HemiHelp members, and HemiHelp CEO Amy Couture. Several educational websites interviewed My HemiCheck users, for upcoming stories. Members and supporters spoke to the media, and published blogs. HemiHelp Patron and MSP Siobhan McMahon lodged a motion in Scottish Parliament supporting Hemiplegia Awareness Week, and wrote a supporting blog post. Hemiplegia facts – especially via our film, and daily infographic visuals – were shared widely, THANKS to you– as well as public figures, charities, service providers, families, and individuals. A resulting social media surge brought thousands to HemiHelp’s website. For more details and exciting social media highlights, see our Storify page.